Presenting educational resources co-produced by teachers and researchers. New workshops starting in January! On November 28th, 2012 the second edition of the Talentlab project was publicly presented at CSIC. This is a project supported by the Unit of Scientific Culture of the CSIC Delegation in Catalonia, and it is done in collaboration with la Mandarina de Newton. The Spanish Foundation for Science and Technology, FECYT, has also provided financial support. 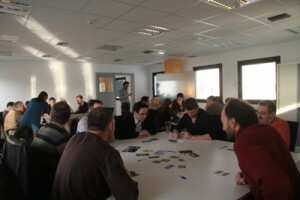 The presentation of the second edition of TalentLab was open to all people interested in science. It took place at 5pm in the CSIC Delegation in Catalonia facilities (Egipcíaques, 15, Barcelona) and it showed the goals and results of the first edition of the project. Among them, the educational resources co-produced by participants. 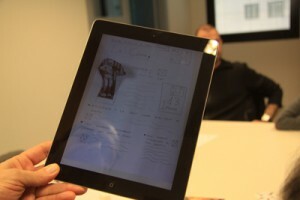 It also presented the new edition of TalentLab and their upcoming co-creation workshops. 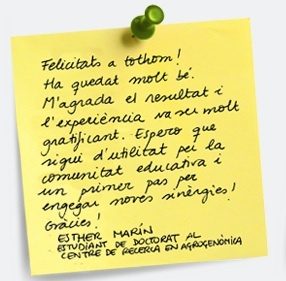 There also was an open round where researchers an secondary school teachers shared their experiences as active participants in the project. Talentlab: past, present and future. TalentLab is a co-creation project. 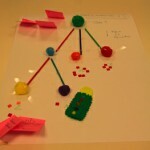 It revolves around the organization and analysis of participatory workshops that put in contact different communities. These communities are mainly researchers in CSIC centers and secondary school Science Teachers. Together, they co-designed new educational and science communication materials for secondary school students, focusing on scientific topics. Its first edition was launched in the 2011-2012 academic year. 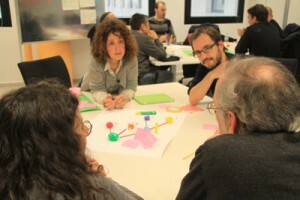 There were four workshops for teachers and researchers. 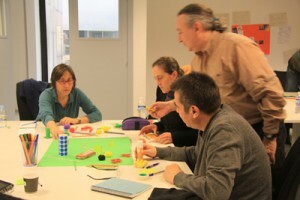 Each one facilitated that their participants worked together to create new online educational resources, These resources were meant to be later shared and used by the broader educational community in Spain. an interdisciplinary research program about local weather and local vegetation to create a visual representation of their evolution under climate change, with a strong emphasis on infographics. The interest of all these resources lies in how they turn secondary school students into the protagonists of a research activity. 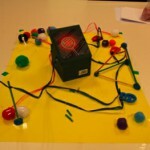 This could promote their capabilities for research, creativity and reflection. The second edition of Talentlab is now under preparation with upcoming new workshops open to teachers and researchers alike. They will start next January, 2013. This time, Talentlab will be focused on archeology, space sciences and marine sciences. It will try to exploit to its fullest the common thread connecting all them, namely, risk and technology. On the other hand, Talentlab has opened a new line of work that includes the participation of a wider audience with the aim of involving them in the design and subsequent creation of a scientific exhibition. 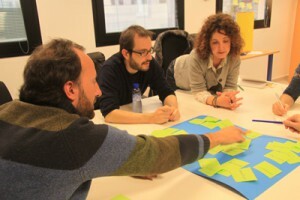 The second session of the “Amongst Intelligent Machines” workshop, from the TalentLab project, took place on March 21st. On arrival, we resumed the groups of the previous session and we started working. First we warmed up engines with an activity that sought to recover and share ideas from the first session. Thus, each group summarized the main lines that define the resources proposed in the brainwritting or fast rain of resources. After being placed, we got straight to the matter and the groups were proposed to specify a single resource proposal. The proposals were constructed by combining knowledge (imagination, experience, talent, etc.) and available materials (clay, ribbons, sticks, balls, etc.). The first group came up with a platform (or box) from wich emerged challenges to be solved by users based on his knowledge of constraints. The challenges could be to design an urban ecosystem management (dams, nuclear plants, etc..) and the users would be different educational centers proposing solutions based on collaborative work. The second group proposed a game that could be physical (boardgame) or virtual designed to exercise how to make decisions and work with values (money, culture, welfare, autonomy, etc.) in connection with the introduction of technology in society. The aim of this dynamic would be to show the influence of values when citizens of a given society make their own decisions. 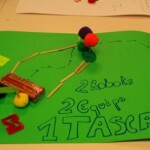 The third group conceived of a resource that would combine computers and robotics in order to work collaboratively. 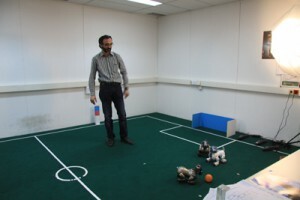 The idea is that two computers or users should design a common task to be performed by two robots like, for instance, two units transporting an object together. To accomplish the goal both robots should establish communication successfully, using Scratch programming to design and simulate the robotics tasks. When the proposals were enough defined, we proceed with a series of iterations in order to improve them. The groups were divided so that one half stayed to defend the proposal in front of “potential users” posing doubts and exposing limitations. The other half went to see the proposal of another group putting on the skin of the “person” defined in the first session. After iterating a couple of times, each group shared the contributions made by other participants, identified certain deficiencies and incorporated new elements from the suggestions received. Thus, the first group saw the need to limit the approach of the platform to a single challenge with goals that should be defined. The second group incorporated the idea that the issues raised should be based on specific situations (such as a daughter that leaves her mother one afternoon with a robot companion). It was stated that the differences in values would emerge more clearly from this kind of situations. Also, he suggested the possibility that the users ponder by themselves the values associated with certain activities. Moreover, was made known the existence of similar resources as the Deliberatorium MIT or a card game. The third group saw the need to establish some kind of sensor-based communication between robots. Later, participants were required to assess in more detail the main aspects of the resource to design (philosophy, theme, methodology, requirements, problems, budget) and these considerations were exposed to the other groups. Once done, there was a vote (I can’t remember the name of the voting system used). The most voted proposal was ArgumentaTIC, created by the second group, although all were well balanced and fairly valued. The possibility to incorporate aspects of the first and third proposals to the chosen proposal was also discussed.From now on we have to work on this proposal and see if it is possible to perform with the available resources, and other to come from other sources (sponsors) or if is more convinient to produce it at a later stage. In the final reflection, some participants expressed their interest in seeing the work done in the workshop translated into an educational resource. A point shared by the organizing team, who reiterated the idea of producing educational resources arising from a process of co-creation, as one of the goals of this project. But at the same time, the team stressed the importance of the working process by itself, ie, the fact of involving teachers and researchers, the working dynamics, contacts established (worknetting) etc. With this workshop we end the series of workshops planned for this year. Hopefully we will see soon the educational resources produced. We also hope that next year we can make the second edition, coming with with new topics (archeology, marine sciences, astronomy, etc.) and work together with more research centers that are asking for more activities. New workshops and new resources.